CRIS Hermetic Pumps Company is specialized in the design and manufacture of reliable and cost-effective hermetic centrifugal explosion-proof electric pumps, the family of which has been manufactured and improved in the Republic of Moldova since 1961. Our goal: to become the leading manufacturer of hermetic centrifugal explosion-proof electric pumps. We see out mission of leading company in the provision of goods and services of the highest quality at the best prices. Our values: to act for the benefit of all who are close to us, including for the benefit of our customers. Since 1961, the plants manufacturing hermetic centrifugal explosion-proof electric pumps in the Republic of Moldova provided the entire Soviet Union with electric pump units for use in the chemical, oil and gas, nuclear, metallurgical, pharmaceutical industries, defence industry enterprises, as well as energy and transport industries. Thus, our specialists have continuity and a very good work experience and understanding of the scope of application, development and production of this class of pumping equipment. In 1994, the plant of hermetic electric pumps ‘CRIS Hermetic Pumps’ was founded as a company specialized in the supply, commissioning and repair of industrial and pumping equipment. Since 1998, one of the main activities of ‘CRIS Hermetic Pumps’ was introduction in technological processes and in the enterprises of the petrochemical complex of the CIS, Baltic and Eastern European countries hermetic explosion-proof ЦГ, НГ and БЭН type electric pumps manufactured by the JSC ‘Moldovahidromash’ as official dealer of the Company. Since 2005-2006, a comprehensive preparation of own production is performed, and since 2007 ‘CRIS Hermetic Pumps’ is a certified manufacturer of centrifugal hermetic explosion-proof ЦГ, НГ and БЭН type electric pumps, as well as hermetic transformer MT, TT and TЭ type electric pumps. 2009-2011. Permanent Customers of the Company are the flagships of the petrochemical industry JSC ‘LUKOIL’, OJSC ‘SIBUR’ (RF), OJSC ‘NAFTAN’, JSC ‘NIZHNEKAMSKNEFTEKHIM’, OJSC ‘MOGILEVKHIMVOLOKNO’ (RB), ‘KAZANSKY NPZ’ and other large enterprises of the CIS countries. In 2013, it was decided to establish a foundry production. In late 2014 commissioning works were completed and the first batch of parts of hermetic electric pumps was casted. In 2015, the quality management system was implemented and certified according to the international standard ISO 9001 and manufactured products are certified in accordance with API 685 standards. 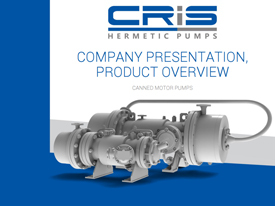 Currently CRIS Hermetic Pumps is a dynamically developing engineering company, numbering about 100 employees, provided with advanced technologies and equipment, certified under the standards GOST R in terms of TR TS 010/2011 and 012/2011.